Thomas Gardiner Corcoran (December 29, 1900 – December 6, 1981) was one of several advisors in President Franklin D. Roosevelt's brain trust during the New Deal, and later, a close friend and advisor to President Lyndon B. Johnson. Corcoran was born in Pawtucket, Rhode Island on December 29, 1900. He matriculated at Brown University, where he graduated as class valedictorian earning bachelor's and master's degrees in 1922. He attended Harvard Law School, graduating high in his class in 1926 and gaining the recognition of Felix Frankfurter. He earned his doctorate in law the next year. He clerked for Supreme Court Justice Oliver Wendell Holmes. He clerked for Justice Oliver Wendell Holmes Jr., at the United States Supreme Court in 1926 to 1927. In 1932, after practicing corporate law in New York City, Corcoran joined the Reconstruction Finance Corporation. When Roosevelt began to take notice of his efforts, Corcoran was given a wider range of responsibilities than his official position as assistant general counsel allowed. 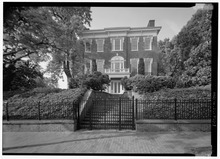 Scott-Grant House, 3238 R Street, Northwest, Washington, D.C. (2000). During the New Deal, two of President Roosevelt's Brain Trust, Benjamin Cohen and Thomas Corcoran, rented the house for themselves and other young lawyers who drafted the New Deal legislation. Corcoran served as special counsel to the Reconstruction Finance Corporation (RFC) from 1934 to 1941. During the same period, he was liaison to Henry Morgenthau, and represented him at RFC board of directors. As an ally of RFC Chairman Jesse H. Jones, Corcoran exercised power far beyond the authority of his office. Felix Frankfurter had recommended many of his former Harvard Law students for work in the Roosevelt Administration, including Corcoran, leading the latter to be associated with a group known as "New Dealers." According to Alan Brinkley, many regarded him as an organizer of the New Dealers and a coordinator of the Washington bureaucracy. Much of his work during the New Deal was in conjunction with Benjamin Victor Cohen. Together, Corcoran and Cohen were known as the "Gold Dust Twins" and were on the cover of Time Magazine's September 12, 1938 edition. Nicknamed "Tommy the Cork" by Roosevelt, Corcoran was the outgoing yang to Cohen's shy and retiring yin. For example, Corcoran colloborated with Cohen in drafting the Fair Labor Standards Act of 1938. After leaving the White House, Corcoran retained enormous influence in the administration, in part because of high appointees who owed their positions to him. Corcoran went into private practice as a lawyer along with former U.S. Federal Communications Commission (FCC) chief counsel William J. Dempsey, whom Corcoran had installed in that job in 1938. Dempsey and Corcoran managed the takeover of New York radio station WMCA for Corcoran's friend, Undersecretary of Commerce Edward J. Noble. That resulted in both an FCC and a congressional investigation. Corcoran's work after leaving government service led him to be dubbed the first of the modern lobbyists. Corcoran's phones were tapped by the federal government between 1945 and 1947. The transcripts of the wiretaps were deposited in the Truman Presidential Library and not released to researchers until Corcoran's death. The evidence is that a Truman White House aide ordered the tap, but it was then rescinded by President Harry S. Truman. It is also alleged that Corcoran engaged in improper attempts to influence decisions of the Supreme Court. Following in their father's footsteps, his son, Thomas G. Corcoran Jr., attended Brown University and Harvard Law School (class of 1967), before founding the Washington, D.C., law firm of Berliner, Corcoran & Rowe. A daughter, Margaret J. Corcoran, also graduated from Harvard Law School (class of 1965), and clerked for Associate Justice Hugo Black of the U.S. Supreme Court during the 1966 Term (the second woman to clerk), while continuing to assist her father at social events. His granddaughter, Sara Corcoran (Warner), earned her undergraduate degree and MBA from the University of Southern California. She is a legal journalist and is the publisher of The National Courts Monitor, a civil courts legal journal. ^ O'Donnell, Edward T. (2002). 1001 Things Everyone Should Know About Irish American History. New York, NY: Broadway Press. ISBN 0767906861. ISBN 978-0767906869. ^ "Thomas Corcoran '22," Government and Politics, Brown Alumni Magazine, November/December 2000. Retrieved March 20, 2017. ^ "THOMAS G. CORCORAN, AIDE TO ROOSEVELT, DIES". The New York Times. December 7, 1981. Retrieved October 20, 2018. ^ Olson, James Stuart (1988). Saving Capitalism: The Reconstruction Finance Corporation and the New Deal, 1933-1940. Princeton: Princeton University Press. pp. 58–60. ISBN 0-691-04749-9. ^ Brinkley, Alan (1996). The End of Reform: New Deal Liberalism in Recession and War. New York: Vintage Books. pp. 50–51. ^ Brinkley (1996), pp. 101–102. ^ McKean, David (2005). "Peddling Influence: Thomas 'Tommy the Cork' Corcoran and the Birth of Modern Lobbying" Hanover, NH: Steerforth Press. ISBN 9781586420864. ^ Lichtman, Allan J. (February 1987). "Tommy the Cork: the secret world of Washington's first modern lobbyist", Washington Monthly. ^ Biography for Thomas G. Corcoran, Jr., at Berliner, Corcoran & Rowe LLP. Retrieved 2017-01-20. ^ "The Supreme Court: A Place for Women", Wilson Lecture presented by Justice Ruth Bader Ginsburg, Wellesley College, November 13, 1998 ("Black was not entirely pleased with Margaret's performance. He thought she didn't work hard enough. One time, for example, she told him she couldn't review 35 cert. petitions (petitions for Supreme Court review) over the weekend, because of plans to attend VIP dinners with her father. She was, in these extracurricular activities, a dutiful daughter. Corcoran was a widower and sometimes needed a substitute for a spouse at special events.") Retrieved 2017-01-20. ^ "Biography - Sara Warner". HuffPost. Retrieved 15 August 2017. ^ "The National Courts Monitor". National Courts Monitor. Retrieved 15 August 2017. This page was last edited on 25 March 2019, at 03:32 (UTC).